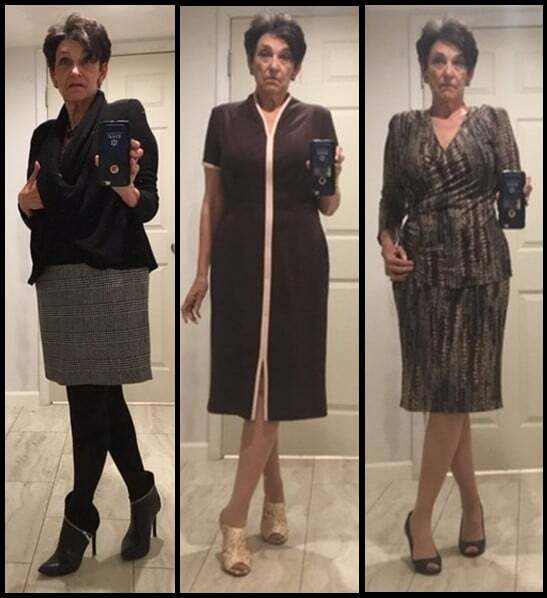 Quite a few readers have emailed, asking how to create a collage of their outfit photos. There are many ways to do that with specialty programs and apps, but my favorite, easy way uses plain old Powerpoint. Within that one program you can manipulate your pictures in so many ways – cropping, re-sizing, re-positioning, aligning – with grid lines to make layouts easy and little or no guesswork. The step-by-step directions sound complicated because I tried to include every detail for an imaginary person with zero Powerpoint experience. You’ll find doing it is much, much easier than writing or reading about it. Open a plain new slide show in Powerpoint. Under the DESIGN tab, choose the “Format Background” icon on the far right. From that FORMAT menu, highlight “Solid Fill” – then click the “Color” drop-down and select Black (black background is optional, but creates narrow black lines between images and around the outer edges of the completed collage). From the ribbon across the top of the screen, click on “Insert”, then in the menu that appears, click on “Pictures” to bring up the list of files on your computer. Find the picture you want to insert, place your cursor over it and double-click. The picture now appears on the slide. Above the main ribbon at the top of the screen, see the tab labeled “Picture Tools” and click on it to reveal a sub-menu. Within that new menu, click on the “Crop” icon at top right. Crop handles appear on all sides of the picture. Move those handles with your cursor to trim away unwanted areas of the picture. Move your cursor away from the picture and into the background area, then click to confirm your crop. Hover your cursor over the newly-cropped image and it will turn into a 4-pointed arrow. Hold down on the mouse and you will be able to move the picture around the background to any location you want. Each corner of the picture has a white circle. Hover your cursor over one of the circles, hold down on your mouse and you can move the circle outward to make the image larger or inward to make it smaller. Insert additional pictures; then crop, resize and position them as desired. You can alternatively use the left/right and up/down arrows on your keyboard to move the images around on the background. When your layout is complete, choose File – Save As, select your desired location to store the file and choose JPEG from the drop-down list of file type options. To remove the excess background area, first locate the saved image in the list of files on your computer. Right click on it to reveal a menu with the option “Open With”. Choose the photo editor on your computer – I used Windows Photo. From the top ribbon, click “Edit & Create” – in the drop-down menu click on “Edit”, then “Aspect Ratio”, then “Custom”. A white-line box will appear outside of your image. Hover your cursor over any side of the box and it will turn into a double-point arrow. Hold down the mouse, enabling you to move the lines, cropping away any extra background. Click “Done” at the bottom right corner of the screen. Click “Save” and your collage is finished! Now I’m looking forward to seeing trios of the outfits you’ve created from the pieces already in your closet.